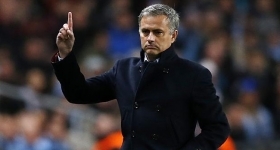 Former Chelsea manager Jose Mourinho looks set to make a move to Manchester United in the summer. The Portuguese head coach has been heavily linked with the United job since his dismissal from the Blues last December. Recent speculation had suggested that the 52-year-old could take over the reigns at Old Trafford, should current boss Louis van Gaal fail to guide the club to a Champions League qualification spot. However, according to The Mail, Mourinho has told his close friends that his proposed switch to United is a 'done deal'. Manchester United are currently fifth in the league standings, six points adrift of fourth-placed Manchester City.